What could be more vacation-ish than the two word combination "beach" and "party" on a summer season? Well my friend, it's time to let your hair down and shop for sunblocks, board shorts or bikinis, and book a flight to one of the World's great party beaches – Boracay! Experience (once again) the fantastic weather and the gorgeous white beach sand on which you can relax during the day, and of course groove to the biggest music festival on the island as Bigfish together with HTC, Bacardi, and Power Horse bring you the most anticipated and the unbeatable two-day music festival on the island of Boracay, happening on March 28-30, 2013, beachfront of Uptown, Station 2 – Bigfish Summer Energy 2013! Bigfish will be bringing in a world renowed and an award winning DJ, O Jon O’Bir, who has earned the admiration of critics and fans for his trance sets which are captivating mix of striking melody and ruthless energy. He is now going head to head with some of the biggest stars including Paul Van Dyk, Sasha, and Tiesto. Jon also headlined Innovation White 2011 that brought in thousands of white-garbed revelers in Manila. On the decks will be joining him the DJ Mag top 100, Sied Van Riel, who won the “best new face” award for the 2008 Trance Awards. Beach House, the collection of sun kissed summer grooves by Hed Kandi will also take you on a musical journey. And of course, Bigfish resident DJ who never fails to hype up the crowd, DJ Chris Raeuber. Summer Energy will start off with a chill sunset session on March 28 at the beachfront of Uptown, Station 2, Boracay and will take the energy up in the main party happening on March 30, also at the Uptown beachfront. Bigfish Summer Energy 2013 is also made possible with the support of our Official Residence Partners, Sol Marina Boracay, The Palms Boracay, and Diamond Hotel. MTV Asia, our Official Music Channel, and Velvet as the Official Lifestyle Channel. Yay! One more week and the big fish will land in Boracay! :) Can't wait for Summer Energy 2013, the biggest music festival in the island. This is gonna be a classic party again and the fine white sands would make it even better. Sounds like a great party! I wish I could go to Boracay one day and attend to a party like this. Another fun party to attend. Boracay is perfect for a party like this. SUMMER IS REALLY HERE!!!! This is a great party. ROCK ON BORACAY! 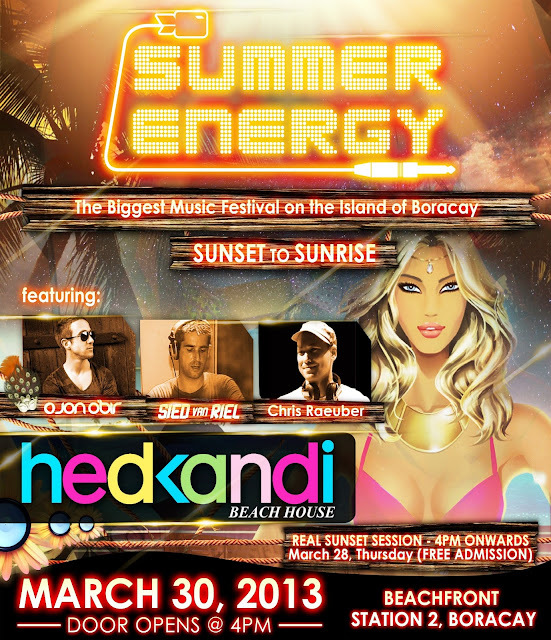 This will be a huge beach party since three best international DJs will be joining the event. Party people will love this! Sounds fun. too bad we already have plans for that weekend. Party indeed! But I'm not into partying but to those it will be a more fun a exciting way to enjoy summer. This party must be great too bad I can't come because I have other plans on that day. i can feel the summer party is coming over. Boracay is one of best destination gonna book for hotel reservation. Awesome party to ignite the summer feel. This is fun! 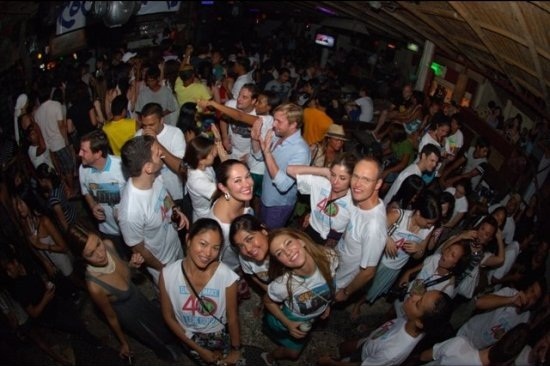 I was able to attend a big fish party in Boracay and it was really fun. time to party!! Big Fish never fails to bring the best parties ever! Parang maganda itong party na toh ah! The beaches, the beach bodies and the beautiful people ---- alam na! Very nice site.. when I was single my night life was also very colourful. Anyways I have enough..